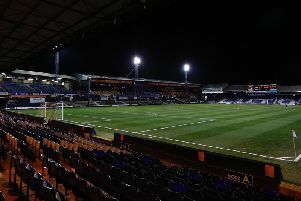 Luton Town have reminded supporters to stay off the Kenilworth Road pitch after an incident during their recent home game against Accrington Stanley. The Hatters went down 2-1 due to Billy Kee’s last minute winner, but one fan jumped over the advertising hoardings to confront an assistant referee, which was reported to the FA by referee Darren Drysdale. Although no action has been taken against the club, a statement on the club website yesterday evening, said: “Following the last-minute defeat in our recent home fixture against Accrington Stanley, the match referee submitted a report to the Football Association regarding incidents which occurred towards, and at, the final whistle. “One supporter came on to the perimeter track of the pitch to confront an assistant referee, and this is totally unacceptable. The participants in any match, be they players or officials, should not be subject to any form of personal confrontation. Any supporter entering the field of play is liable to arrest and Luton Town will co-operate fully with the police to identify anyone guilty of this offence. “As the visiting players and officials left the pitch at the end of the match they were the subject of verbal abuse from a minority of supporters in the Enclosure, and the retractable tunnel used to protect the match participants was kicked and punched, causing damage which has cost the club hard cash to repair. “Football is a passionate sport and emotions were running high following the late Accrington goal, but Luton Town cannot condone such aggressive and threatening behaviour. “There were also reports of missiles being thrown at the match officials. This is a cowardly act and anyone proven to have thrown any missile towards the field of play will become the subject of a club ban and will not be welcome at Kenilworth Road in the future. “The Football Association have the power to issue sanctions against the club by way of reducing our capacity in certain areas of the stadium, which would directly affect supporters' ability to sit where they want to sit and potentially the club's finances. “Luton Town is very proud of our vociferous and loyal support. The atmosphere inside Kenilworth Road can be intimidating and partisan – we love that. However, we will not condone or protect those supporters who act in a way which brings us such unwanted attention from the Football Association.